Fluid resistant, tie-on masks for general surgical and patient care use. Available with or without an anti-fog, anti-reflective face shield. The masks have >99% Bacterial Filtration Efficiency (BFE) and >95% 0.1 micron filtration efficiency. 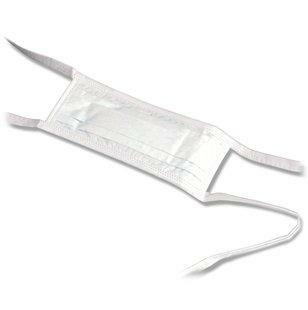 For those who prefer a flat mask, the Tie-On Face Mask provides comfort and breathability. Adjustable to fit a variety of facial shapes and sizes. Tie-on mask is soft and lightweight for comfortable wear. 50/box, 12 boxes/case. Sold by the case (600 total).